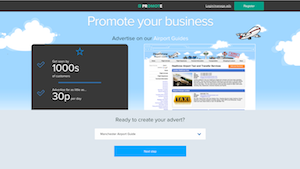 We have plenty of opportunities available if you wish to advertise with the Airport Guides. If you are interested in promoting your taxi or transfer service to or from Manchester Airport then take a look at our Taxi and Transfer Services page. We have different visibility options, and you can set up, manage, and preview your advert from our advertising platform OMOT. It’s not just taxis – if you’ve got a travel related service you’d like to promote then we can help with that!